I remember the spring before my boys graduated from high school. It was a time of tremendous excitement and stress. We were planning a big graduation celebration and my friends were helping me with the decorations and invitations. But planning high school graduation should begin long before the party. 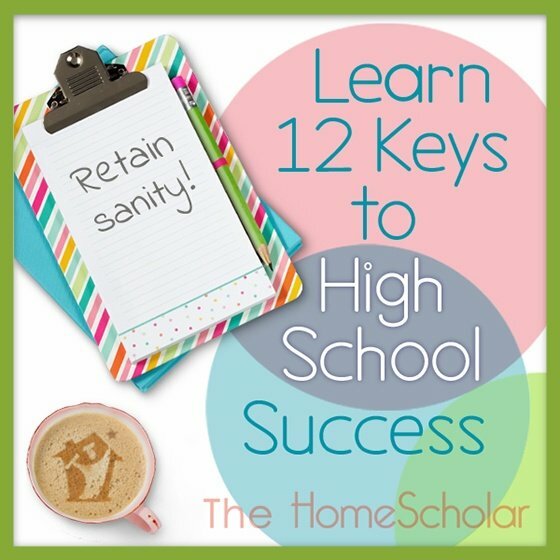 It should begin the day you decide to go the distance and homeschool your child all the way through high school! Whether you are the parent of a middle schooler, trying to understand the coming years, or the parent of a high schooler wanting to do a check-up, let me help. No matter where you are in the process, this simple checklist will be useful. Parents can provide college preparation during high school that benefits every student. If they ultimately don’t go to college, then your homeschool education will be the only education your child gets.. Make it great! They’ll be well prepared for life and their civic responsibilities. Plus, if your child ever changes their mind and decides to go to college, they will have a much easier time getting in. On the other hand, some parents know early on that their children are college bound. For these children, a college prep education can influence the quality of the colleges where they earn admission. Time spent on college preparation can benefit every child! During eighth and ninth grades, find out about your own state requirements and make a plan to meet them. Review the common college expectations for recommended high school courses. Look over your high school plan at least once a year. As you begin to focus your child on college and career goals, you may need to adjust your plan slightly each year as you go. Budding nurses and engineers may need to buckle down on math, and children who want missionary preparation could benefit from more foreign language learning. So, review it yearly while you relax and enjoy a lifestyle of learning. Try to include essay writing in your plan. The ability to write a few paragraphs quickly can be beneficial for both college and career dreams. • Four years of English (reading, and writing at your child's level). • Four years of math at your child's level. • Three to four years of social studies, including world history, U.S. history, economics, and government. • Three years of science, and at least one science with a lab. • Two to three years or more of foreign language instruction. • Physical education is rarely required, but some colleges want two years, or half a credit per year for four years. • At least one year of fine arts: music, theater, art, dance, or a combination. • Make sure your child has plenty of electives. Electives can be anything required by state law, required by parents, or any delight directed learning your child engages in. They could include Bible, driver's ed., keyboarding, logic, computer science, or your child's specialization. High school testing can cause stress for parents and students. What test should your child take when, and how do you know? Most of these answers are found on two websites: The College Board and ACT.org. I recommend having your child take the PSAT in October of 10th grade for fun, and again in October of 11th grade. This will give you information about their test taking abilities, and which tests might be best for them. After that, your child may need to take two kinds of tests. Virtually all colleges require a test such as the SAT, ACT, or CLT. Give your child a complete sample test, timed and in the comfort of your home, where nobody will get hurt, rewarding them with a sweet treat if necessary. Taking a sample ACT and SAT is the single best way to decide which test is naturally best for your child. Then choose the right study materials, specific to the test they will take. Practice regularly, three or four times a week, until they take the test. The other kind of test many colleges expect to see is one or more subject tests, such as the SAT Subject Test, AP Test, or CLEP. Subject tests can be helpful for earning scholarships as well as admission. Choose the right test for your child so they can pass with flying colors. Study for the test at home with your child, to be sure they will pass when they take it for real. Never have your child take a test if you believe they will not pass. Subject tests are best taken immediately after they complete each subject. For example, your child should take the SAT Subject Test in French right after they finish studying French. Consider AP exams when those courses are complete as well. They are more intensive subject tests, but they can earn college credit! An activity list is similar to a resume. Collecting interests in an activity list can help with both college admission and career applications. Job experience, volunteer work, and involvement in groups will improve chances of employment and college admission. Activities show your child is committed, well-socialized, and works hard, rather than being a couch potato, watching the world fly by. Even an ordinary teen can have an extraordinary activity list. Identify what they do for fun and then encourage them. Think about family activities or jobs your teen does. Add co-op memberships, volunteer and paid work, and group participation; it all counts on an activity list. Finding a college is more than watching where your friends and neighbors’ children go to school. Take your sophomore or junior to a college fair and/or search online for the perfect college match for your student. Once you have some possibilities, visit the college in person. Visiting is the only way to see if it’s a perfect match. Try to whittle down the list to a handful of colleges by the end of junior year. When you visit, ask about their homeschool admission policy. Find out what records they want from you, and any additional testing requirements. By the end of junior year, make a list of four to eight colleges where your child will apply, including both public and private colleges. Choose a mix of reach, fit, and safety universities. A "reach" school has higher average test scores than your child’s, but they meet the college requirements. Be careful, though, because all Ivy League and military academies are reach schools, no matter how high your child’s scores might be. A "fit" college score is about the same as your child’s score, and they meet the college requirements. A "safety" school means your child’s test scores are higher than the college scores, and they exceed the college requirements. We all know we should be saving for college, but we certainly have varying degrees of success doing so! You can look for scholarships at any time, but if finances are a huge concern, you may want to work on a scholarship search during sophomore and junior years. When you are looking at colleges, don’t be afraid of private schools. They often give significantly better financial aid than public schools, and their prices are often comparable. Forbes Magazine published an article called “The World's Most Expensive Universities” that explains, “Those costs reflect a trend among private American universities - charge a stratospheric tuition fee, then offer a generous financial aid package.” Don’t be afraid of the list price of a school. Spend time researching how your child can get scholarships. During senior year, you should complete the FAFSA to determine if your child qualifies for need-based scholarships. This IRS-style form will help colleges determine how much money the government thinks you can afford to pay for college - often with hilarious results. Here we are worrying about the price of gasoline, and they think we can afford that amount? The FAFSA will be used to determine how much financial aid colleges may provide. Keep your homeschool records ready to go at all times, updating them every year. You will need a homeschool transcript. Most colleges also require or request course descriptions that include information about what you did, what you used, and how you graded each class. You may be asked for a reading list and activity list or resume. Some applications require a school profile, explaining your homeschool policies. Once you decide where your child will apply, ask those colleges which high school records they want from you. It can vary significantly, and there is no way to know unless you ask. They may only ask for a transcript. Some colleges also want a simple reading list, but others want to see exhaustive course descriptions and grading criteria. Find out their requirements early so you can give colleges what they want. Occasionally they have strange and unique requirements. So, I always recommend keeping everything from high school – you never know what they will want. One college asked me for an English paper I had graded. Another college wanted subject tests in many different areas. Like a Boy Scout, be prepared! At the end of homeschooling, at the end of senior year, remember to send the college a final transcript that includes graduation date, final grades, and grade point average. College applications are long and complicated. Admission essays are tedious and time consuming for the student to write. The best plan is to begin the application process during September of senior year, to allow enough time to complete it in a timely fashion. It’s possible to write college application essays in junior year if you want to plan ahead. You can always edit them again right before submission. Each college may require two or more essays, and their application can include many more additional pages. Start working on applications early in senior year. Scholarship and admission decisions are “first come, first served” so always be first in line. This is one reason it’s important to make college choices before senior year even starts, so you are ready to go. Complete all applications before Thanksgiving of senior year, if possible, for best results. The application deadline may be later, but they will be swamped with applicants near the deadline. They can give your application a more relaxed reading if you turn it in early. 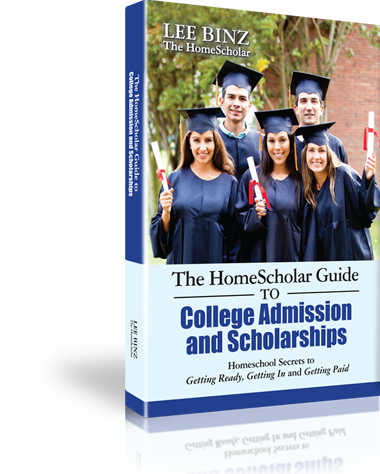 Homeschoolers have the advantage in college preparation! We are intimately involved in our children’s education; we know their strengths and weaknesses, their goals and passions. The best guidance counselors are parents because we are love-givers, not care-givers. In school settings, a guidance counselor may know a lot about tests and deadlines, that’s true. But they have hundreds of students to help, and they may speak to each student only once or twice. Like our wonderful student-teacher ratio, our student-advisor ratio can’t be beat! Be brave! Parents know their children better than anyone, and they are perfectly capable of providing the guidance children need through high school. You can do it! Sometimes life happens, and the best laid plans of homeschool parents have gone astray. There is an “app” for that! I have an emergency panic plan in case you have completed none of the previous steps. Some parents don’t plan ahead. 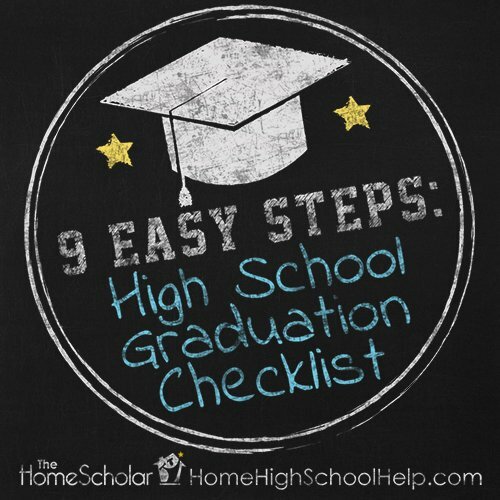 For them, the checklist for graduation is more challenging, with firm deadlines and unique challenges. If you don’t have a clue about college admission and your child is in the midst of senior year, it’s difficult to regroup to experience success. Second best success is also possible. Here is a quick checklist - a panic plan for those hopelessly behind parents of seniors. That's it. You can do it! Just take it one step at a time. 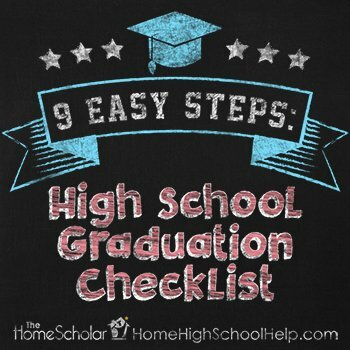 Once your child has graduated, be sure to celebrate their success and present a homeschool diploma. There’s nothing more stressful to parents than college admission and scholarships. Many parents question whether it’s even possible to find a college that satisfies both parent and child, a college that will love their student and offer them scholarships to attend. Learn the secrets to successfully navigate the college process from start to finish, including selecting a college, negotiating college fairs, earning merit-based scholarships, and marketing your student effectively. Receive gentle encouragement and practical help from a mentor who really understands. Relax and enjoy a casual conversation, sprinkled with scripture, humor, valuable tips, and quotes from The Princess Bride! Whether you’re looking at college entrance for your first graduate or want to do better with your next child, you will find countless treasures in this book. Do you need a boost of encouragement and lots of proven tips to help you have your most successful homeschool year yet? Let me help you. Take my free recorded class filled with tips, and it even counts as continuing education! I know there are homeschool parents who can compete in the Tour de France while nursing their newborn and teaching their high schoolers Advanced Latin. This class in not for them. This workshop is for those mortal, human, sometimes frail and tired homeschoolers, who truly want to do the best job possible preparing their children for college, but could use a little extra "boost." I promise you will learn solid strategies that will make homeschooling easier and more rewarding for both you and your children! Listen to it and let me know what you think! If you are a beginner at homeschooling high school, consider the High School Solution, which provides detailed training on homeschooling, from middle school through senior year. The resources included give specific help for all stages, from getting started and planning high school courses, to understanding high school testing and college admission and scholarships. 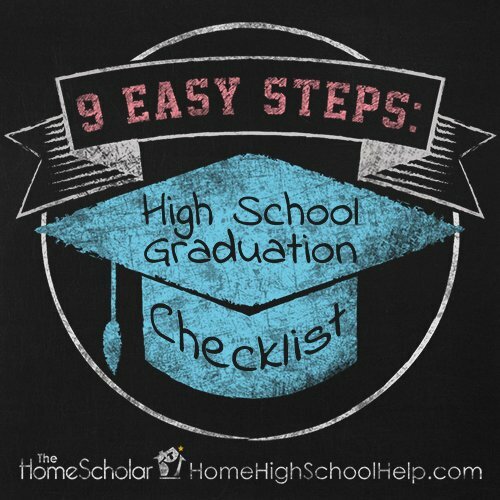 Copyright © 2018 The HomeScholar LLC, www.HomeHighSchoolHelp.com. Text may be reprinted without permission if used in full, except for use in a book or other publication for rent or for sale. 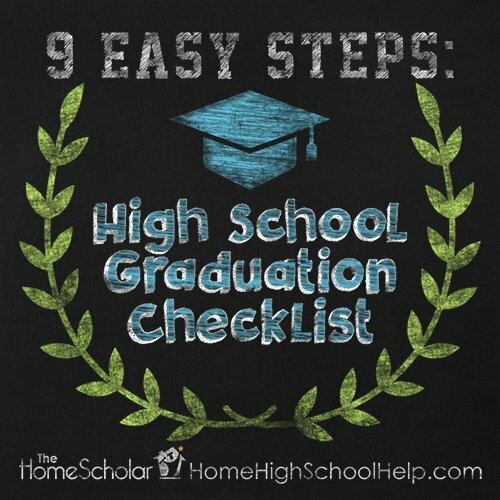 Reprint must include this copyright, bio (below), and the original URL link - https://www.homehighschoolhelp.com/9-easy-steps-high-school-graduation-checklist.